Rio Salado College | RioNews: What Does it Take to Meet Student Expectations? What Does it Take to Meet Student Expectations? Rio Salado Dean of Enrollment Services Rachelle Clarke joined Dean of Instruction and Academic Affairs Shannon McCarty to share insights and perspectives with The EvoLLLution team about the use of technology in meeting the expectations, demands and needs of today's students. 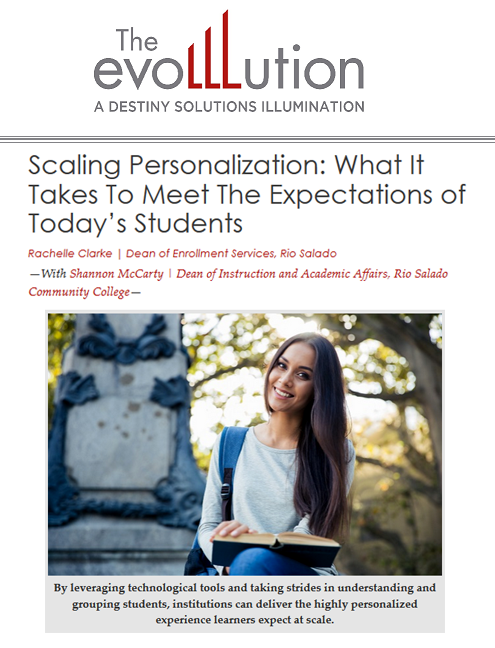 In this interview, Clarke and McCarty focus on the importance of personalization and customization of services-- and how technology can help educational institutions improve their student services, experiences and successes. Read the full interview now. Your thoughts? Engage in the dialogue!